Timothy enjoyed his visit with his grandparents in AZ and did well on his first two airplane flights. He returned in time for his first Easter Egg hunt in our living room, which went into extra innings in order to find the last missing egg, which Laura discovered later that afternoon in her purse (editor’s note: it is hard to overemphasize the importance of an accurate ‘answer key’ if you choose to do your egg hunt indoors). Timothy’s face has once again become a testing ground for new facial expressions. He is scrunching up his face and crinkling his nose and squinting his eyes to go along with more mouth variations than Baskin Robbins has flavors. But as fun as it is to watch, this new trend is complicating our Father-Son game of call and response (it’s also possible that he just got bored and decided to kick it up a notch). A month ago, I would make a simple sound, and he would throw a sound right back at me. But now, if I make an ‘oooo’ to him, his face becomes a slot machine of expressions — his eyes start blinking and he cycles through a dozen facial expressions in a few seconds, and lets outs a scream or grunt. He always finishes the face parade with his signature move, the Fish Face. Fortunately, all of the new facial expressions are fairly happy and positive. He has, however, started looking out the corner of his eyes more often — and will sometimes turn his head so that he can look at you out of the corner of his eye. This is funny, but makes him appear a little less trustworthy than he seemed during his first seven months. 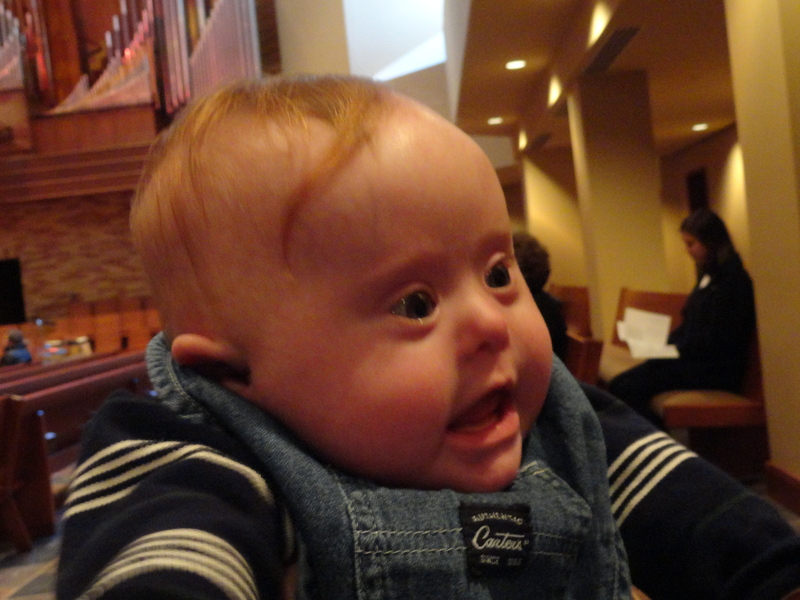 Timothy has his developmental ‘test’ with the school district folks on Tuesday. It’s a check in on his progress against the plan we set in the Fall, to see if his gross and fine motor skills and cognitive development are on track, and to create the next set of milestones. He should be fine in most areas, but is still working on being able to sit up on his own. The only disappointing thing is that Timothy has known about this for months, and yet it looks like he’s going to wait until the very last minute to do any studying for his very first test. I shudder to think about how he’ll approach the SAT. We went to see the ENT specialist on Tuesday to find out more about T’s hearing. It looks like his hearing is close to normal, and we’ll test it again in a few months. But the appointment started in an unusual way. The doctor walked in, looked at Timothy and asked, “So, are you considering a helmet?” I’m not much of a hat guy, much less a helmet guy, and so I wasn’t sure how to respond. The doctor explained that he was referring to the shape of the back of Timothy’s head. Apparently, TRBL tends to turn his head more often to his left (which means the muscles on that side are better developed), and he tends to lie that same way when he sleeps on his back at night. As a result, he has a small flat spot on the left side of the back of his head. Now, our family is used to large heads, but this flat head thing is a new deal. But the doctor said that it’s not a Down syndrome thing and is pretty normal and that it might be correctable by just adjusting how he sleeps and helping him strengthen the neck muscles on the right side by encouraging him to turn his head to the right more often. But the ENT suggested that if it’s not getting better in a month, we should consider a helmet. He said that a baby generally wears the helmet for 23 hours a day for three months. The sense of urgency is because the shape of a baby’s head is largely formed by the time he reaches a year old. Laura and I were taken aback by the diagnosis, but as we looked at the back of his head, we saw that the doctor was right. So we’ll keep an eye on it and spend the next month getting T to turn more and sleep more to the right side. If that doesn’t correct it, you might see the human cannonball wearing a gold colored Notre Dame helmet for the summer. For solidarity, I might suggest that the whole family wears helmets this summer along with Timothy, which should go over well with T’s teenage sisters. Back to facial expressions, Timothy saves his cutest ones for when he’s eating. His eyes light up, his mouth opens wide and he looks on with great anticipation at the sight of a spoon filled with pear mush. We’ve introduced oatmeal, peas, pears and beans, and the lad is consuming them at record pace. Soon, we’d better also introduce the concept of ‘exercise’ to his routine, or else we’ll be shopping for his clothes at Baby Gap Big and Tall. This entry was posted in Communication, Doctor, happy ears and tagged Easter, Facial expressions, GG & Bapa, Head shape, Jan & Joan, Travel. Bookmark the permalink.